When you know or suspect that your transmission has something wrong with it, it’s a sinking feeling. 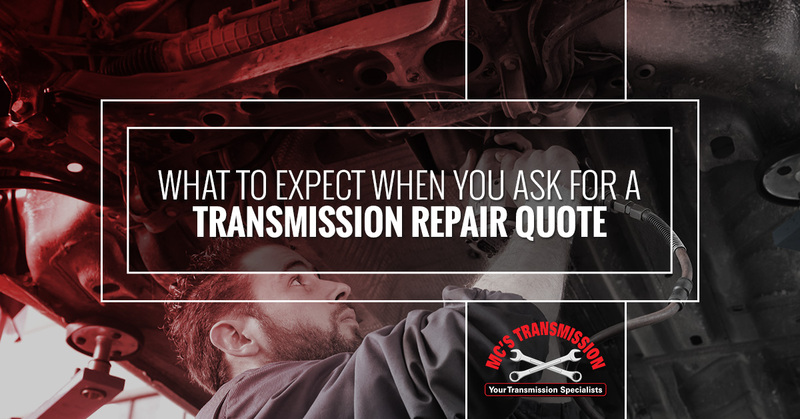 Requesting a vehicle repair quote for any issue can be a hassle, but transmission repair can feel like one of the most intimidating things of all. However, it doesn’t have to be intimidating if you know what you are getting into. The more knowledgeable you can be when you go in for a quote, the more you can expect to get a good outcome and avoid getting ripped off. This doesn’t mean that you have to be a transmission expert in order to talk to the people at your local transmission shop. Just knowing some of the following tips can go a long way toward making sure you choose the most reputable shop, get a good outcome, and make the right decision for your vehicle. 1. Expect that the shop will be able to diagnose your transmission without taking it apart. A common scam in many shops that claim to be transmission repair specialists is to tell the customer that the only way to diagnose the transmission problem is to take it apart first. Not true. Once you have the transmission taken apart, you’re stuck. It’s much more difficult to take it to another shop for a second opinion, and the shops know this. They want your business, and this is one way to not only get it, but charge you whatever they want. However, a more trustworthy transmission mechanic will be able to get customers’ business without having to trick them into staying at his shop. Your transmission mechanic should be able to diagnose your transmission issue before they take the vehicle apart. However, as with any vehicle issue, there is always the potential for unforeseen complications. Just because something new arises in the process of your transmission repair doesn’t mean that the job is being done poorly. However, the better mechanics will get closer to an accurate and comprehensive diagnosis on the first try, because they’ve seen more transmissions and they know just about every possibility of what could go wrong. 2. Expect to have clear, transparent, upfront communication at every stage of the process. Your transmission repair shop should communicate with you if there is anything that does arise in the process of repairing your transmission. For instance, if they discover anything that will alter the initial quote, such as a cracked or worn part that is going to fail soon, you should be contacted to know about this and approve the replacement of the part. If you’ve called 3 places and one of them is giving you a quote that is astronomically cheaper than the others, don’t fall for it. It may be a bait-and-switch scam where you give that shop your business, only to have the charges multiply after the fact because the shop never gave you the “worst case scenario” price. If you need transmission repair, you need it to be done at a reputable shop. Bring your vehicle to MC’s Transmission for honest, quality work and an outcome that you’ll be happy with.